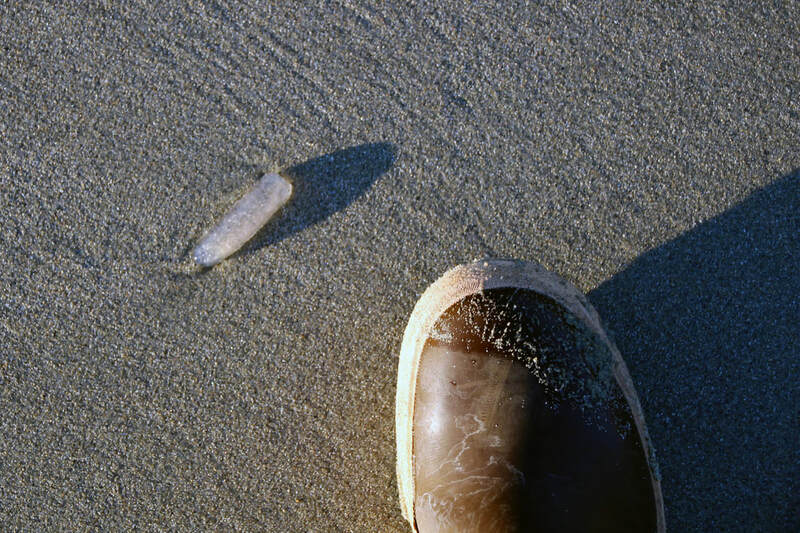 Pyrosome found washed up on a Central Coast beach, with boot for scale. Photo by Sara Wickham and identification assistance from Jackie Hildering (The Marine Detective). While pyrosomes may be mistaken for jellies due to their gelatinous texture, they are actually colonial tunicates: each hollow, tubular pyrosome is composed of thousands of tiny individual zooids. Pyrosoma atlanticum has a tough, bumpy texture, gets up to 60 cm long (but may be much smaller, and has been described as pickle-shaped), and is colourless or tinged with a bit of blue, grey, yellow, or pink. This is the most common pyrosome worldwide. 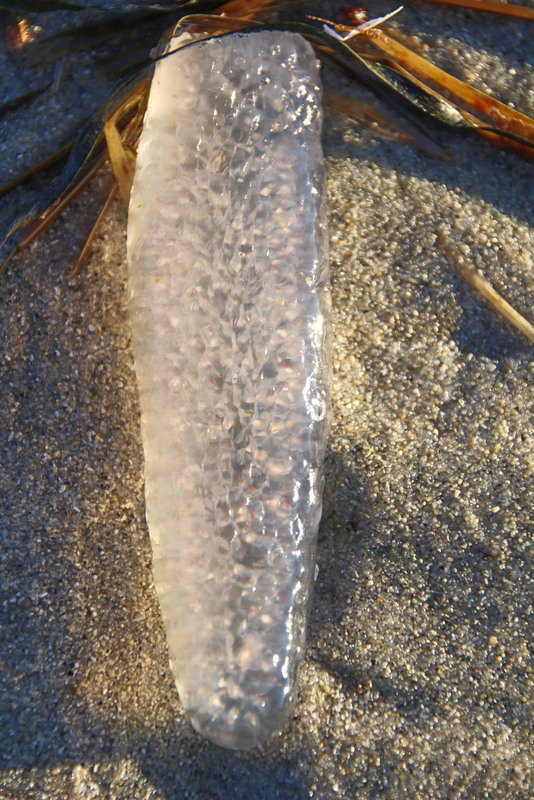 Read more about this pyrosome and see more photos on this blog post by The Marine Detective. Like other pyrosomes, Pyrosoma atlanticum is a pelagic species and therefore is not often found along shorelines; it undergoes diel migration (daily vertical migration in the water column) between waters at 750 m deep and the surface. It is found in tropical and temperate waters worldwide: its distribution is described as between latitudes 50°N and 50°S, however warmer waters may bring it outside of this range. This pyrosome could be mistaken for a squid egg mass — however the latter is a closed sac of eggs rather than a hollow tube, and usually appears in large bunches. The genus Pyrosoma is named for its bioluminescent ability. Even among other bioluminescent organisms pyrosomes are notable for the bright and sustained light they produce; this light is produced in response to light instead of to touch or disturbance. In 2017 Pyrosoma atlanticum appeared en masse in the Pacific Northwest; click here to read about this "bloom". Jackie Hildering. (2017). Pyrosomes! Say What? The Marine Detective. Accessed 14/3/2018. Pyrosoma atlanticum Péron, 1804. SeaLifeBase. Accessed 14/03/2018. Pyrosoma atlanticum. Zooplankton Guide. Scripps Institute of Oceanography. Accessed 14/3/2018.